In August 2015, ACTEX published Actuaries in Microinsurance, an innovative anthology touching on the actuarial aspects of this growing area of insurance. This month we interviewed Jeff Blacker, FSA, MAAA, who edited this book with Mary Yang. Blacker tells us about Microinsurance and why you should read the book he helped put together. ACTEX Learning (AL): Tell us briefly about Microinsurance (MI). Jeff Blacker (JB): Microinsurance protects low-income people in developing regions around the world. Compared to traditional insurance markets, MI premiums are lower, polices are easier to understand with fewer exclusions, and administration is designed to be lower cost per policy. The volume of microinsurance is large and growing, but it has not yet reached its full potential. The MunichRe Foundation website provides "landscape studies" which summarize the number of lives covered, amount of premiums inforce, and types of products available. MI initiatives face many challenges, such as achieving scale and sustainability. 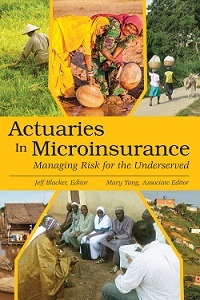 AL: Why would actuaries be interested in reading Actuaries in Microinsurance? JB: First of all, it will be an entertaining way to learn about a field of actuarial work that has direct positive social impact. By inserting an anecdote between each technical chapter, my hope is that the book will be enjoyable to read. It is not meant to be a textbook. This book should also save actuaries time. The number of resources online is almost overwhelming (e.g. the Microinsurance Network alone has over 500 high-quality resources). Most of the resources online are written for a broad audience of MI experts and contain information that is less useful to actuaries. This book is a more efficient place for actuaries to gain knowledge. Our chapter "Data Sources" includes a table to help actuaries locate helpful information online. AL: How did you first get interested in this topic? JB: I left a traditional actuarial job in 2007 in search of more fulfilling actuarial work that involved travel and helped others. I stumbled onto microinsurance shortly thereafter. I began reading articles and publications that were online. I searched the internet for organizations that were involved in the field. I wrote several offering to volunteer. Eventually the volunteering and networking led to consulting projects, which have been some of my most rewarding work experiences. AL: What is unique about Actuaries in Microinsurance? JB: Half of the chapters are short anecdotes, or personal stories, from actuaries working around the world in this field. The personal anecdotes give non-microinsurance experts a sense of what it is like to work in developing regions. The remaining chapters are more technical. The technical chapters are written and edited by actuaries with the aim of discussing and educating on a wide variety of topics directly relevant to other actuaries. AL: What was it like to write this book? JB: I only wrote a couple of chapters myself. We have over 20 authors who contributed, so my biggest task was staying organized while editing the chapters. The associate editor, Mary Yang, was a big help. We also contacted many organizations involved in microinsurance to see if they would provide a high-level review of an early draft. Their feedback was outstanding and made this a better product. Actuaries in Microinsurance: Managing Risk for the Underserved (ACTEX, 2015) is now available for purchase at ACTEX | Mad River Books in printed and eBook formats. Update: ACTEX is hosting a webinar on The Value of Microinsurance for the Insurers and Insureds on Tuesday, September 12th. The webinar will feature a panel discussion with three experts, moderated by Jeff Blacker. In 2016 Jeff Blacker presented a webinar with ACTEX, Actuaries in Microinsurance: New Developments and Challenges in Insuring the Underserved, a recording of which is now available for purchase on the ACTEX | Mad River Books website. 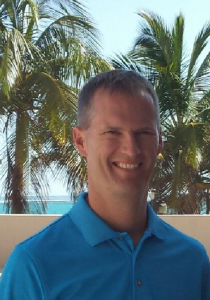 Jeff Blacker FSA, MAAA: Jeff is an independent consulting actuary and actuarial exam instructor. Most of his career has been in the U.S. supplemental health insurance market. In Guatemala and Nicaragua he priced microinsurance products including life, cancer, and accident insurance. In Kenya, he analyzed health microinsurance claims experience and provided recommendations to improve the sustainability of an insurance product. He has also enjoyed working in India as a microinsurance volunteer. As an actuarial exam instructor with The Infinite Actuary, he prepares students through online seminars for Society of Actuaries exams. Mary Yang, FSA: Mary is an actuary practicing in the international retirement and investment space. From 2008-2013, Mary led the Capacity Building Programme of the Microinsurance Innovation Facility, housed at the International Labour Organization. She is experienced in addressing international human resources (HR) issues and has carried out multi-country projects on a range of HR topics including benefits policy, design, valuation and risk management. Mary is a Fellow of the Society of Actuaries in the U.S. She holds a Master in Business Administration from INSEAD in France as well as a Bachelor of Science from the University of Illinois Urbana.